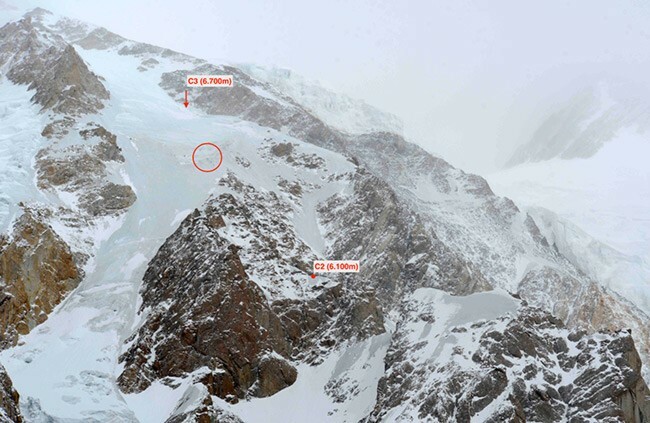 Alex Txikon, Daniele Nardi, Muhammad Ali Sadpara and Muhammad Khan reached camp 3 today (March 11, 2015) at 4 p.m. Pakistani time. Team have covered 2600 meters from base camp to camp 3. Blue ice and fast wind made climb difficult, Alex reported from camp 3. First communication of the day took place at 8 a.m in the morning, Alex reported that “wind is terrible, around 60-70 Km/h and it is not possible to leave for camp 3.” Bursts of wind kept shaking camp 3 all night, climbers could barely sleep, night was just like a nightmare, any men with conscious mind would have turned back from this point, it is our passion for Nanga keeping us going. Second communication took place at 10 a.m. Alex reported that wind is still fast, but coming down slowly, fog is getting lighter and we can see cracks in clouds, we will wait till 11 a.m. Base camp checked weather on internet and reported to team that there is slow wind not more that 30 km/h till Sunday, and there is light precipitation. There starts the field of blue ice which was most difficult part of the day, in summer this section is field of snow, in winters it is hard ice and even hard for crampons to leave a scratch in this hard ice. They reached camp 3 at 4 p.m., each one of them was carrying 20-25 kg, which include food, gas, 600 meter rope and screws. Next few days, wind is suppose to stay calm, tonight they will sleep and make up mind of camp 4 for tomorrow.